On a cold and overcast day like today, I could have spent hours perusing the Alima website. It’s easy to navigate, the product photos and overall design are aesthetically pleasing, and you’d be hard pressed to find another cosmetics line with such a gorgeous variety of colors. Deciding what to drop in your shopping bag might be the only difficult task when you visit Alima, and I find myself discovering another blush I want to try each time I take a peek. Needless to say, I’m a fan. But when I was sent the new spring eyeshadow collection, Welcome to the Rainforest, I wasn’t sure I’d find the colors all that wearable. Two of them are bright and light colors that I usually don’t go for, and all of them are rather sparkly, so they sat on my bathroom counter for a couple weeks before I decided to actually play with them. 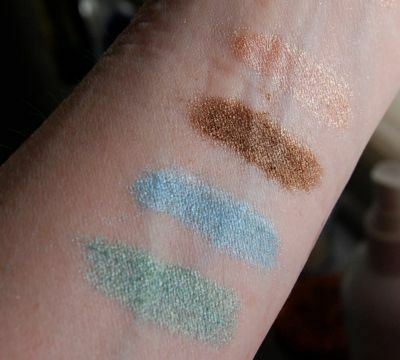 Alima does a fantastic job of describing their colors, so there’s no need for me to change their verbiage: Jaguar is a slinky, golden-brown shimmer, Macaw is a light shimmering teal, Kapok is a deep, dark brown sparkle and Bromeliad is a sparkling light green. It was Macaw and Bromeliad that gave me trepidation with their easter-egg likeness. There was, and still is, no way I was going to use them all over my eyelids and then go near the door. But turns out, they both make absolutely stunning eyeliners. I used my favorite brush for lining, Alima’s #35 Eye Detail Brush, and came away with a surprisingly subtle flash of green from Bromeliad and a darker than expected pop of shiny teal from Macaw. Probably not my quick-run-to Trader-Joe’s-look, but definitely perfect for a night out or enjoying a special lunch on a day off. Jaguar and Kapok being earthier colors are more in my comfort zone and create a lively take on the smoky brown eye. As a wash, Jaguar is a peachy light brown that sparkles with shimmers, not chunks. Nevertheless, it shimmers enough so I’ll be saving Jaguar for evenings. When paired with Kapok as an eyeliner on the lower lid and smudged out on the top, you get a warmish-brown smoked eye that will look even more amazing with a summer tan and a sundress. Jaguar on top left, Macaw on top right, Kapok on lower left, Bromeliad on bottom right. Jaguar on tippy top, Kapok on mid-top, Macaw on mid-bottom, Bromeliad on very bottom. With every purchase of the limited edition Welcome to the Rainforest collection, $2 will be donated to the Rainforest Action Network. 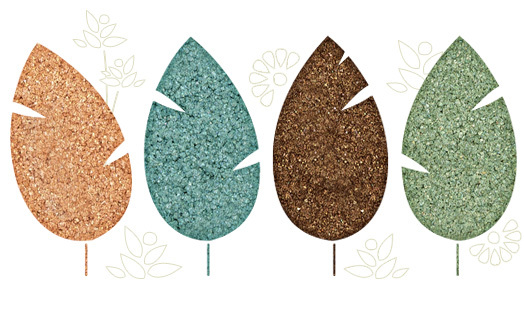 Alima is 100% natural mineral makeup and is cruelty free. Please read more about their safety and standards. Welcome to the Rainforest is available at Alima for $30. Disclosure: Samples were sent to me for consideration by Alima. The opinions in this review are my own. I was not financially compensated for this review or any other. beautiful colors-makes me feel like painting! These colors are pretty. They aren’t my everyday colors, but I like for LE collections to not be my everyday colors. (I want to replenish my everyday shades). I’ve been so happy with all Alima Pure products that I have tried. Thank you for recommending them to me. Such a good point V! Limited Editions are for experimenting and trying out unusual colors. That blue and green look so pretty for spring! Pretty swatches! Thanks for sharing. I have been meaning to try some Alima eyeshadows. Alima is wonderful Ariel. You should check out their blushes and brushes too!